Quite a few months ago I purchased a YongNuo Speedlite YN460-II Flash, so I thought it was time I wrote a review of it. The two main things to note about this flash is that it is very cheap compared to the majority of flash units, and secondly that it does not support TTL. It is a manual power only flash. For me, manual power is fine. For this review, I'll compare the YN460-II with the Nikon SB-800 flash. I purchased a couple of SB-800s back when they were they were Nikon's top model (and were very expensive). In hindsight this was a mistake, as I hardly ever use TTL flash. They do offer quite a few other features as well though. Today the Nikon SB-800 Speedlight flash sells for quite a lot less than it used to, and is much better value for money (~ £150 - £180 second hand). But does it offer as much value for money as the YongNuo YN460-II (£33 new)? 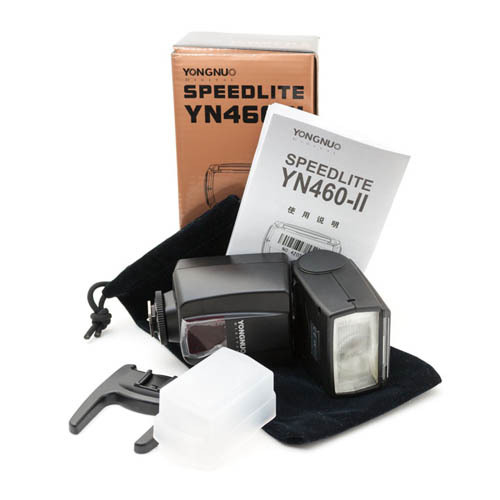 Similar to the SB-800, the YN460-II comes packed with a soft cloth bag and a small diffuser that clips onto the end of the flash. The diffuser is virtually identical to the SW-10H diffuser that ships with the SB-800. While the flashes don't have identical designs, the ends of the flashes are the same, so the YongNuo diffuser will fit on the SB-800 and vice versa. One thing that you do get with the Nikon SB-800 Speedlight, but you don't get with the YongNuo Speedlite YN460-II, is an additional battery pack (SD-800 Quick Recycling Battery Pack). This takes a single battery and allows for faster recycling times. I've never used this myself, as it requires using 5 batteries together as a group. Batteries are typically sold in packs of 4, and my chargers will only charge 4 batteries at a time. So it wouldn't be convenient for me. I hardly ever need fast recycling times, and when I do, I just increase the ISO and use a lower power setting on the flash. Given the similarities between the two flashes, it could be that Nikon's SD-800 Quick Recycling Battery Pack will work with the YN460-II. I haven't actually tried it though. It does slot in the battery door space, but won't slide up all the way without removing the battery door, and I'm not sure if the door on the YN460-II is designed to be removable or not. A small stand is included that allows you to stand the flash up off-camera on a flat surface. A 1/4 inch thread is located on the bottom of the base to allow screwing the stand onto a tripod that uses a 1/4" screw. The YN460-II's stand isn't quite as good as the AS-19 stand that ships with the SB-800. The Nikon stand features 3 shoe positions, while the YongNuo stand only has 1 shoe. The Nikon stand has a metal screw socket on the bottom, while the YongNuo's is only plastic. So the stand could be better, but there are not any real issues with it. You also get a brief manual that tells you how to use the flash and provides some light humour with its bad translation, e.g. Do not use this flash against the person needing high attention; otherwise, it may cause safety accident. The YN460-II has a guide number of 38m at ISO100, the same as the SB-800. Power is adjustable from 1/64 to full power, not quite as good as the SB-800, which goes down to 1/128 power. However, the YongNuo flash offers finer adjustment of power, allowing you to adjust in 1/7 stops compared to the 1/3 stops of the SB-800. Does this actually matter? In my experience, 1/3 stop is plenty fine enough adjustment. The issue with the YN460-II is that by default you can only adjust power in full stops. To adjust by 1/7 stops, you need to adjust power to the nearest full stop, then hold down the mode button and press the pilot button. You can then adjust up / down in 1/7 stops. You can't adjust down from 1/64 power or adjust up from full power. So, in my opinion this method of controlling the flash power is not as convenient as being able to adjust in 1/3 stops normally. But it is not a big deal. Being able to use the flash off-camera is very important to me. Despite the YongNuo's cheap price, it does very well in this area. It features a built-in optical trigger. This is placed at the front of the flash, masquerading as an AF-assist lamp (which the SB-800 does have, but the YN460-II is missing). The good thing about the YN460-II is that it offers two optical slave modes. The first is designed to work with manual flash. The second mode is designed to work with cameras that fire a pre-flash before the main flash, e.g. any compact camera, DSLR flash in TTL mode. This means that the YN460-II can be used with a basic compact camera that has no flash control. Nice! Being a manual flash it doesn't feature any of the TTL / CLS niceties that the SB-800 features. But I never use those anyway, so no loss as far as I'm concerned. 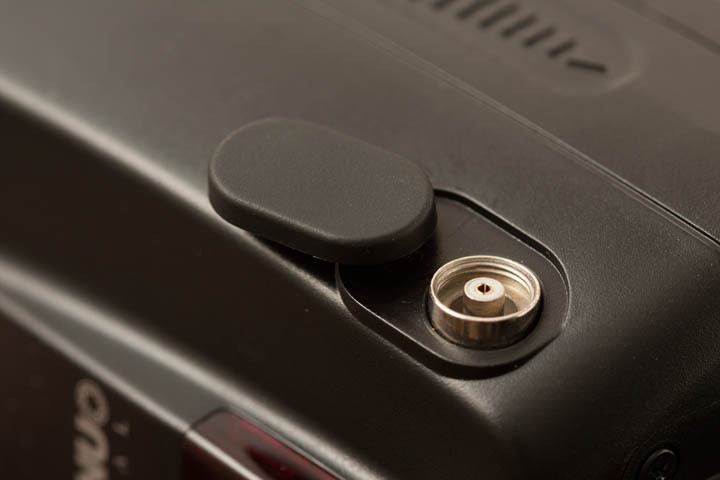 The YN460-II features a PC socket as well, so you can use it off-camera via a PC-sync cord. My radio triggers use PC cord connections, so this is very useful for me. The YN460-II does not feature a zoom head. I can't find the angle of coverage in the manual, but it looks like it is designed to cover a 35mm lens on a full frame camera. A diffusion panel pops out of the top of the flash and can be used to increase coverage to 18mm. This compares with the SB-800, which has a zoom head that goes from 24mm to 105mm. Flipping out the diffusion panel takes the wide-angle coverage to 17mm. With both flashes adding the diffusion dome will increase the angle of flash coverage further. While a zoom head is nice to have, I can live without it. The flash coverage can be widened by adding a diffuser or narrowed by adding a snoot. 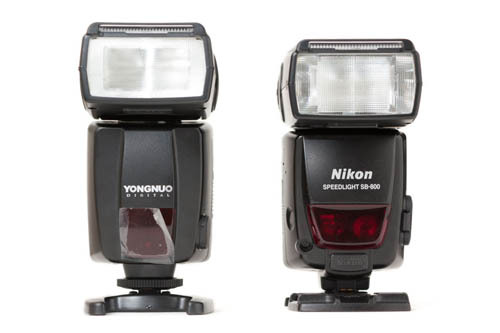 The YongNuo flash (and the Nikon SB-800) features a pop-out bounce card at the top of the flash as well. I can't say I've ever found the little card useful in my photography. But I'm sure it has a use for others, otherwise they wouldn't include it. An important feature when using a speedlight (or speedlite depending on your terminology) on camera or triggered optically, is the ability to rotate and angle the flash head. This allows you to point your camera in one direction, while pointing the flash in another direction, to bounce light off a wall or ceiling. If relying on the flash being triggered optically, then you can have the optical sensor of the flash pointed towards the camera while pointing the flash head in a different direction. Again, the YongNuo YN460-II is very similar to the Nikon SB-800 in this regard. The head rotates 90° in one direction, 180° in other. It can be angled at 90° (pointing straight up), 75°, 60°, 45°, 0°, and -7°. (I'm basing the -7° angle on the Nikon SB-800, as this stop is not actually marked on the YN40-II flash but it has two distinct positions around 0°, just like the SB-800). Another good point about the YN460-II is that it features a metal foot. This is much preferable to flashes that use a plastic foot, which can break. (The expensive Canon MT-24EX flash uses a plastic foot, and I have had that snap on me). The flash locks into a shoe by use of a wheel, which extends the locking pin on the flash's foot when it is tightened. I prefer the locking switch mechanism on the SB-800, which is must faster to use. 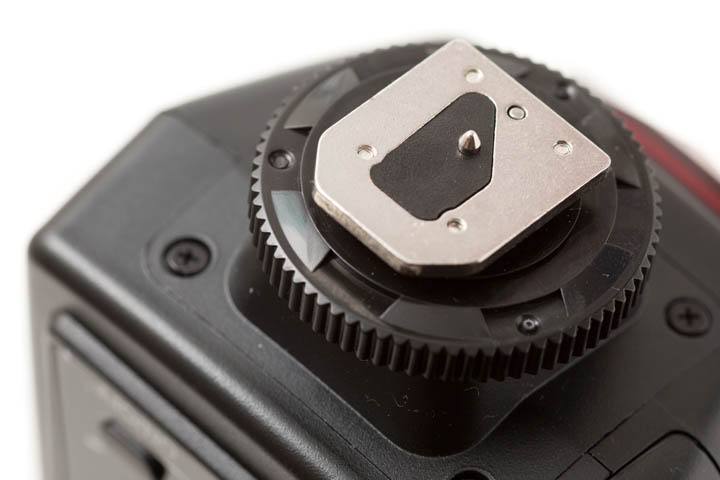 The foot features a central contact pin, meaning it is compatible with any camera that uses an ISO standard hot shoe (i.e. most cameras apart from Sony). Given the cheap price of the YN460-II, it's not surprising that it is missing quite a few features of higher end flashes. So far I've mentioned the lack of TTL / CLS, no quick recycle battery pack, no AF-assist, and no zoom head. The YongNuo flash has no power socket. So there is no way of using a power pack with it (for faster recycling times / longer usage time). Nor can you use AC power with the flash. Neither are an issue as far as I'm concerned. High speed sync (Auto-FP in Nikon language) is also missing. While I have used this feature on my Nikon flashes in the past, it was more due to lack of knowledge than the feature being needed. High speed sync lets you shoot at a shutter speed faster than the flash sync speed of the camera (typically around 1/200s). But so long as the ambient light levels are low, then the flash output will be the main light source, so your shutter speed is effectively the flash speed. The flash output is very fast (1/1050s at full power for the Nikon SB-800, 1/32300 at 1/128 power). Who needs high speed sync? (Well some people will, but not me anyway). 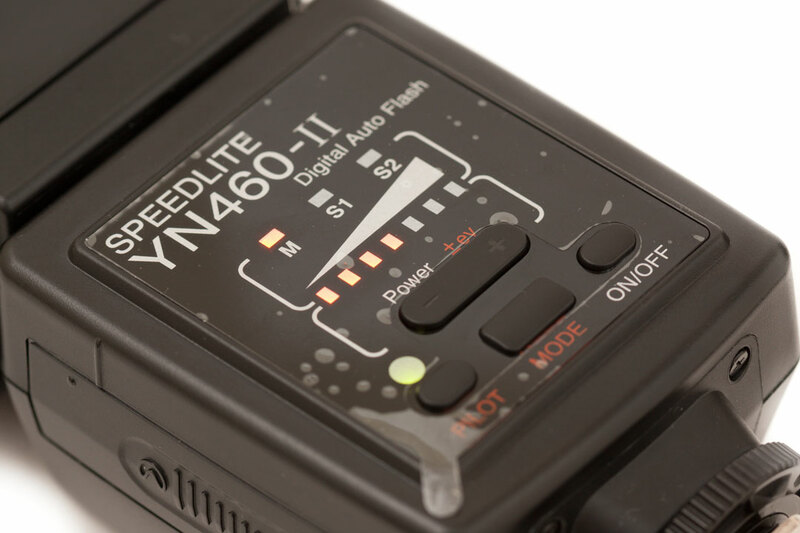 As stated earlier, the YN460-II is a manual only flash. Not only does it lack TTL flash, but it also has no auto mode. It doesn't have a stroboscopic mode either. Neither points are important to me. I have found the YN460-II to be pretty reliable, but not 100% perfect. A few times I have switched it on, the flash charges up, and the ready light comes on (goes from red to green). And then the flash just switches off. Switch it on again and it works fine. A bit of a strange issue, but not too much to work around every now and then. The other issue is that the flash will go into sleep mode if not used for a few (3-4) minutes when not in an optical trigger mode. This is an issue when using the flash on-camera, or triggering it by radio trigger. You can wake the flash up by pressing a button. But really, it would have been much better to allow switching this feature off. The Nikon SB-800 features similar power saving, but at least you can switch the feature off with that flash. 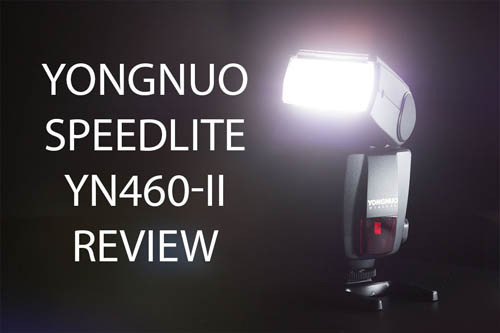 So, overall, I do like the YongNuo Speedlite YN460-II. The built-in optical trigger with support for triggering with cameras that fire a pre-flash is very nice. The PC socket is great (no hotshoe to PC adapter needed). The head tilts and swivels. The power is adjustable. That's all I need in a flash really, and for the price I think the YN460-II is well worth it. For purchasing YongNuo flashes, it is generally recommended to purchase from the official YongNuo ebay store . (Note that although the store lists the YN460-II in several versions for different camera models and manufacturers, they are all the same except for any designed for use with Sony's hotshoe).